The Gannon University women’s basketball team survived a most unusual road trip over the Thanksgiving holiday break, splitting a pair of games at the Mt. McKinley North Star Invitational in Fairbanks, Alaska. The Knights traveled some 10,000 miles round trip to take part in the two-day event Thursday and Friday at the Alaska Airlines Court, beating host Alaska Fairbanks, 74-65, Friday one day after falling 63-45 to the University of Tampa. The previous week, the Knights split with Fairmont State and Bowie State, winning 80-63, at Fairmont, W. Va., on Nov. 14 and losing 59-46 to Bowie State on Nov. 17 at the Hammermill Center. Gannon (4-2) returns to action at 5:30 p.m. Wednesday at the Hammermill Center against Daemen College in the team’s final nonconference tuneup before starting Pennsylvania State Athletic Conference action this weekend on the road. In Friday’s win over host Alaska Fairbanks, Gannon used a 10-2 scoring surge to cap the third quarter for a 52-42 lead before going on to claim the win. The Knights shot 52.9 percent from the floor in the game and rolled up 27 points from the bench. Nicole LaCava scored 18 points and grabbed nine rebounds to lead Gannon, which also got 10 points from Chelsea Rourke. Rourke and Aiora Rivas helped Gannon open the second half on a high note before a three from Boston McKinney at the 2:02 mark of the third quarter expanded the lead to 51-42. Layups from LaCava and Rourke helped Gannon maintain a nine-point lead with just under seven minutes to play, and the lead ballooned to 15 at one point. The Knights used some strong foul shooting down the stretch, making five of their last seven attempts, to hold on for the win. In Thursday’s game, Tampa held a decisive edge in the rebounding margin (39-26) and poured in 30 points in the paint as the Spartans led from start to finish.Gannon had three players finish the game with eight points — Sydney Mitchell, McKinney and Tori Obenrader — but was held without a player scoring in double figures for the first time this season. No one grabbed more than four rebounds. On Nov. 17, Bowie State used a strong third quarter surge to take control over the Knights, outscoring Gannon 22-6. Rourke’s 10 points paced Gannon, which shot just 36 percent from the floor. Bowie State went 17-of-27 from the floor in the third quarter while the Knights were just 7-of-24 in the period. 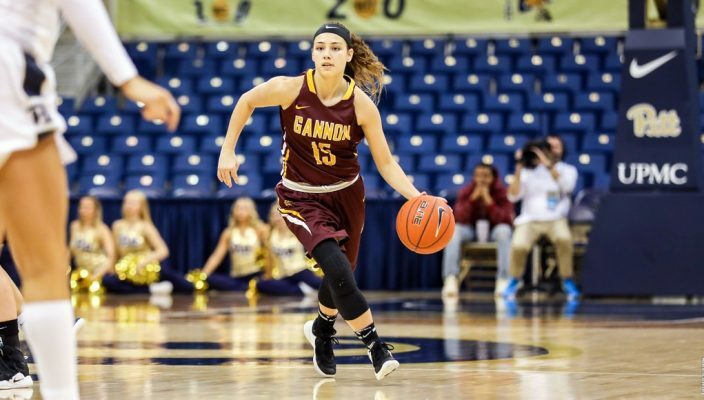 On Nov. 14, Gannon trailed 29-28 at halftime but ripped off a 17-3 run to start the third quarter to take command in its win over Fairmont State. LaCava scored 10 points during the pivotal stretch and finished with 13 for the game. Rourke’s 20 points led the Knights, and her 3-pointer early in the second half keyed a 17-3 run. Gannon shot 7-of-12 during that stretch, which lasted nearly seven minutes, and didn´t turn the ball over a single time. Following Wednesday’s nonconference game against Daemen, the Knights will visit Bloomsburg at 1 p.m. Saturday and Mansfield at 1 p.m. Sunday.